I Work at JoAnn Fabrics!!! Hey everybody! I wanted to spread the awesomeness- I just scored a seasonal position at JoAnn Fabrics!!!!! AHHHH! I’ve been there about 2 weeks now, worked maybe 5 days total (I’ve been busy too plus they’ve been training lots of newbies). I am so excited to finally be working somewhere that my crafty skills might actually matter and benefit the job! Especially since I could actually be one of those people who makes the crafty items they show as samples. I’ve always wanted that job! One of my favorite parts of the job so far is working the cutting counter. I thought it would be really hard because I absolutely hate math and doing conversions? Just forget it! But nicely- most people ask for their fabric cut in yards, so I don’t have to do any of the conversions, but lately everyone keeps asking for 5 feet…and I just stand there and stare at them while I think! Ha but uh hello, it says right there that 3 feet = 1 yard…so this should really not be a critical thinking part. One lady kept staying “5 yards” when she meant “5 feet” so I counted it out and kept repeating, “5 yards?” until finally she corrected herself! haha But seriously, I just love it. You learn about all these cool projects- one woman had me cut 2 yards each of about 20 different colors of sequin trim- she was making pasties for a burlesque party 🙂 haha She was telling me about the party, sounded so fun! So now I have this lovely new job and I’m so happy to be working there 🙂 I really enjoy it and I hope I will learn lots of new things and be able to share them with you all! 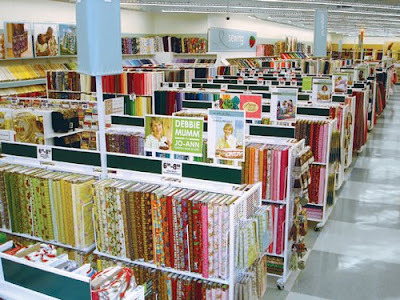 Right now I am enjoying learning about all the different fabrics while I work at the cutting counter and help customers throughout the store find what they are looking for. I’m a quick learner too! This entry was posted in Art, Inspirations and tagged christmas job, DIY, employed, home, joann fabric, job, seaonal position, style on November 19, 2012 by christinapertz1. Oh man that sounds like the perfect seasonal job! So much fun and you get to show off your crafty skills! So does this mean you get a discount because I have a list of stuff I need that I can send over…. 😉 Hooray for fun jobs! ha Its a great discount! I’m really loving it and hoping to continue part time after Christmas! That sounds so awesome!! I’ve always wanted to work at a craft store!! Especially the fabric counter cause I feel like you can learn so much! Like there’s this one girl that works at Jo-ann’s and she always asks me what I’m making, and I love it and I feel like she learns a lot that way! Plus it’s cool to hear what kind of stuff people come up with! Yeah there is so much to learn about fabric and the many notions and craft supplies! I hope I have lots more to share with everyone throughout the next few weeks especially! Congrats on the seasonal job. I wanted to pop over & thank you for tweeting about the giveaway. I have an art blog too, but need to get my self back to daily practice. I have been writing & crafting more that creating art. I need to balance it better, lol. Thanks! Black Friday was nuts, but I loved it! Will definitely stop by for the next giveaway!